Members of the National Guard and Reserve can retire after they have performed 20 or more years of creditable military service. Active duty reduces the retirement age by three months for every 90 days served. For some members of the Guard and Reserves, that could mean starting retired pay as early as age 50, but not sooner. The law does not change eligibility for military medical benefits, however. In order to receive military retiree medical benefits, the member must still wait until age 60. 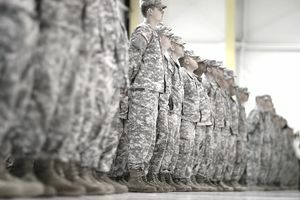 Under the new law, members of the National Guard and Reserves are able to reduce the age at which they are eligible to receive retirement pay by three months for each cumulative period of 90 days served on active duty in any fiscal year. Most active duty time qualifies. This includes involuntary mobilization, voluntary active duty, training, operational support duties and attendance at military schools. It also includes medical treatment or evaluation for disability or medical studies. Also included is full-time National Guard duty served under a call to active service by a governor and authorized by the president or the Secretary of Defense, for purposes of responding to either a national emergency declared by the president or a national emergency supported by federal funds. Only active duty time performed as a member of the Guard/Reserves count. In other words, if a member joined active duty for four years, then got out and joined the Guard or Reserves, the active duty time does not count toward earning early retirement. However, it does count when computing retirement points. The amount of retirement pay received is based on a system of points earned for Guard/Reserve and active duty service performed during their careers. A reservist performed five days of active-duty service on MPA orders in February 2017. He then volunteered for active duty beginning June 1 and ending Nov. 30 (leave, reconstitution and post-deployment/mobilization respite absence included, as applicable). The reservist performed a total of 127 days of active-duty service in fiscal 2017 and 61 days in fiscal 2018. Under this scenario, all of the active-duty time the reservist performed could be credited toward reduced retirement age eligibility because it was active-duty time performed under circumstances permitted under the law. However, because time credited must total 90 days or must be in multiples of 90 days in the aggregate during a fiscal year in order to correspondingly reduce his retirement age by three months, or multiples of three months, the reservist will be able to reduce his retirement age by three months for fiscal 20`7. Had he performed 53 more days of active-duty service after Jan. 28 and before going on active duty June 1, he would have accumulated 180 total days for fiscal 2017 and thus would be able to reduce his retirement age by six months. Similarly, because the reservist has so far served on active duty 61 days in fiscal 2018, he must perform an additional 29 days of active-duty service sometime during the year in order to reduce his retirement age by an additional three months.